Elemental Container is proud to announce that its parent company Tournaire S.A., has been awarded a Gold Medal in recognition of CSR (Corporate Social Responsibility) achievement. Recognizing social responsibility and engaging stakeholders. Ways to integrate socially responsible behavior into the organization. Achieve consistency with existing documents, international treaties and conventions, and existing ISO standards. Promote common terminology in the social responsibility field. Broaden awareness of social responsibility. This Gold Medal ranks Tournaire among the top 5% of companies evaluated by the platform! This award and its ratings are provided by EcoVadis which operates the first collaborative platform providing sustainability ratings for global sustainable procurements. Their team of 500 talented professionals from 40 nationalities combines expertise in CSR, advanced technology and a full service solution to deliver CSR ratings to drive meaningful change in the sustainable procurements worldwide. 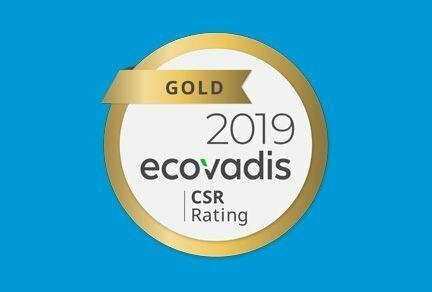 Combining People, Process and Platform, EcoVadis has developed the industry-leading team, innovative technology, and a unique CSR assessment methodology that covers 198 purchasing categories, 155 countries, and 21 CSR indicators. More than 55,000 companies use EcoVadis to reduce risk, drive innovation and foster transparency and trust between trading partners. They work with companies such as: Nestlé, Johnson & Johnson, Salesforce, Coca-Cola Enterprises, Nokia, L’Oréal, Bayer, Subway/IPC, Heineken, ING Bank, Air France-KLM, Centrica/British Gas, BASF, and Merck. We’re humbled to receive such recognition as we continue to provide our customers outstanding service.